Net Wt. 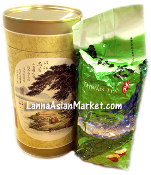 8 OZ Ingredient: Oolong tea leaves. Directions: Add proper amount of tea into the tea vessel, pour in boiling water and let it infuse for 2-3 minutes. The tea can be infused several times. the use of clay tea vessel makes tea more flavarous.